Swan Lake Guest Cabins offer Glacier Park, Jewel Basin hiking area, Whitefish and many other lakes and attractions less than an hour away. Bigfork Village with it's many galleries, shops and restaurants is only ten minutes away on Flathead Lake. The Terrace Supper Club is just a short walk on Swan Lake's Emerald Bay. Boat rentals are available on Swan Lake. 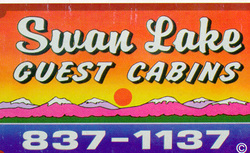 Swan Lake guest cabins are nestled at the very foot of the Rocky Mountains and Bob Marshall Wilderness Area. Walk out the door and hike all day, or stroll the grounds enjoying the many views of Swan Lake, mountains and abundant wildlife. These new log cabins feature handmade log furniture, microwave, refrigerator and coffee maker as well as a porch swing, picnic table and a gas barbecue or outdoor gas cooker with a griddle, for breakfast in the woods. Experience the feel of the deep woods while you enjoy the comfort of baseboard heat and clean modern bathrooms in a secluded, private wilderness setting. Directions: Swan Lake Guest Cabins is located 9 miles SE of Bigfork Montana on Highway 83 up private road just north of milepost 78 and just south of Terrace Supper Club. We are just 1 hour from Glacier National Park! 5 miles to numerous golf courses and 2 ski resorts.